AWARD winning Liverpool based Ditto Music have revealed the final line-up for its all-dayer next month. 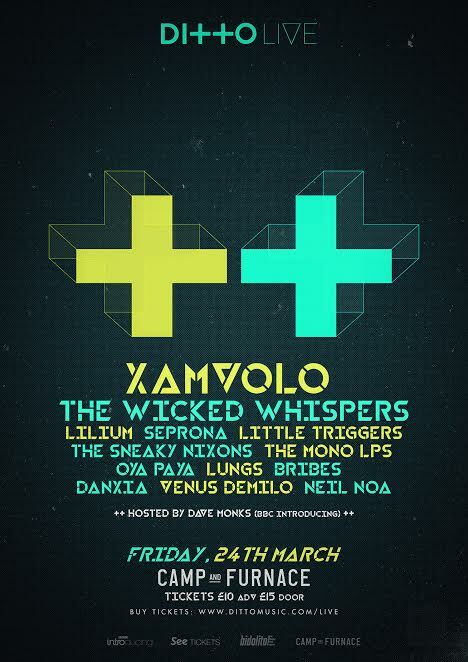 Lungs, Bribes, Danxia, Venus Demilo and Neil Noa will join a sturdy line-up of some of the best independent artists and record labels across Merseyside at Camp and Furnace on Friday, March 24. Artists already announced include XamVolo, The Wicked Whispers, Lilium, Seprona, The Sneaky Nixons, Little Triggers, The Mono LPs and Oya Paya. The digital distribution and record label services platform serves more than 100,000 artists and labels across the world, this event will be the tip of the iceberg with more exciting to be revealed in the coming weeks. Talking about hosting the event, BBC Merseyside DJ Dave Monks said: "Musically Liverpool is buzzing at the moment and already there are things in place for 2017. "I am looking forward to hosting Ditto Live, they have announced XamVolo as the headliner who has a voice that we first spotted two years back with his Binary in Blue EP. "Since then he has been getting lots of support from BBC Introducing and Radio 1 and recently signed to Decca. "This night is building up to be a top night of local music with a selection of bands we have supported on the radio during 2016."